December at Birmingham Cathedral – more on this closer to the time. 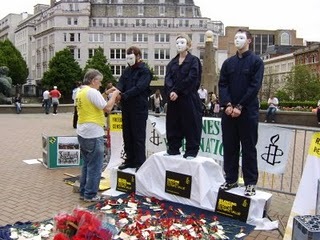 Bournville Amnesty International group now have a new website at http://bournville.amnesty.org.uk/ – why not take a look? On Wednesday 24th February 2010, Brian Fargher passed away. Brian was both a personal friend and chair of the Bournville Amnesty International Group. Brian had been involved with Amnesty for over 5 years and was a dedicated human rights activist. For me the most memorable action we were involved in was when he coordinated a public action to protest against human rights violations in China in June 2008. The event led to 450 red carnations with messages being sent to the Chinese Embassy. Pictures of that day can still be found at http://chinaactionday.blogspot.com/ and i’ve included one above. He was a great believer in local groups working together and his legacy goes on in the close relationships that Central Birmingham and Bournville groups have maintained to this very day. 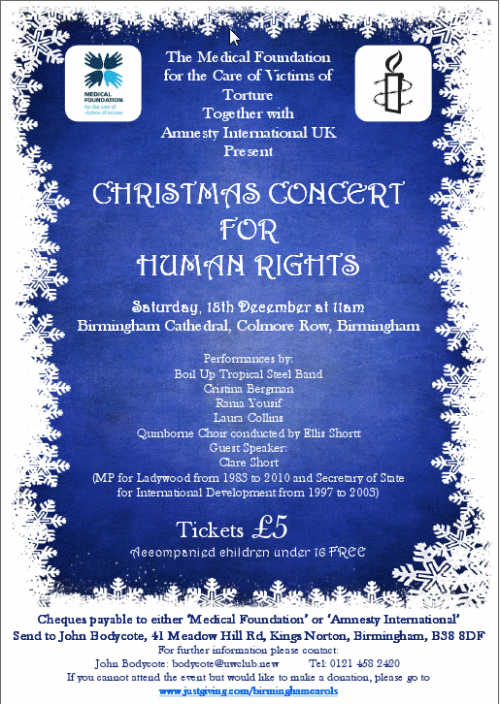 In addition he regularly lobbied Edgbaston Labour MP, Gisela Stuart on human rights issues. Brian as well as being occassionally stubborn could be incredibly warm and funny too. Brian, I thank you for the great memories and believe your life made a positive difference. I hope others who read this blog will leave their own comments and tributes. His funeral will be this Thursday 2.30pm at Sutton Coldfield Crematorium and all are welcome to attend. If you are unable to attend and wish to make a contribution to his chosen charities please email me at westmidsamnesty@gmail.com for further information.